A Tribute to Wally (Walcott) Davis by Stu Cassell. Sadly, here’s another short article about another friend who recently passed away, Wally Davis. Stu Cassell Speaks: I can’t believe in just the span of a few weeks we lost two of the folks in Avon Park, Florida who introduced my wife and I to shuffleboard and in the process became our good friends. First George Brockelbank, and now Wally Davis. In the article I wrote about George right after he died, I mentioned that he came by our house with another man from the shuffleboard club to pick up some items we were donating to their annual fund raising yard sale. That other man was Wally. In any group there are folks who don’t wait to be asked, but just jump in and do things for the betterment of the organization. Wally was one of those guys. Whether it was repairing something or sweeping the courts and spreading beads, I never saw Wally when he wasn’t pitching in. Wally had a great sense of humor and was always a fun guy to be around. He was one of many who coached me when I was a raw newbie to shuffleboard. 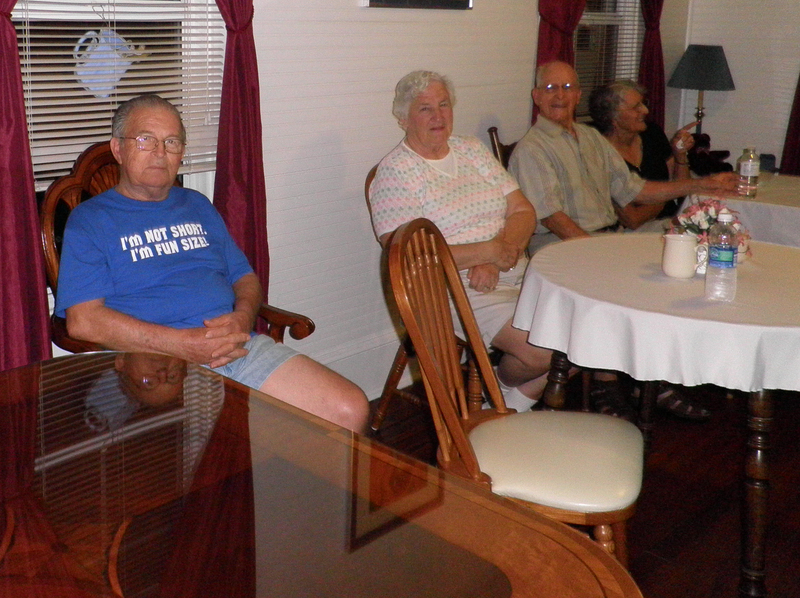 The picture I have attached features Wally in a t-shirt that says “I’m not short, I’m fun sized.” To his right are Anna Hanson Eldredge, and George and Nancy Brockelbank. It was taken on July 4, 2010. It was our first summer in Avon Park and we invited everyone to join us for an ice cream social while we watched the fireworks from our front porch. Wally, like George, made a lasting impression on me. They’re gone, but will not soon be forgotten. Rest in peace my friend. Stu Cassell. Formerly an Active Member at Avon Park. 2018 05 13.